I sit too much. I always have. By nature, I guess, I am a sedentary person. I’m not fidgety. I can sit for long periods of time reading a book or working at the computer. I exercise every day, going for a long walk or working in my garden or doing yoga, and I thought that was enough. Wow, I need to move a whole lot more! 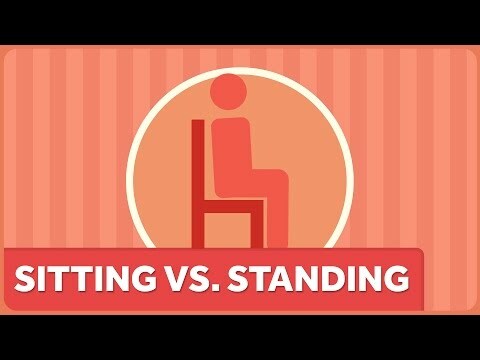 We all understand that sitting too much is bad. An inactive lifestyle leads to obesity, heart disease and some cancers. Some of us watch too much TV (thank you, instant streaming!) or play too many video games, but many of us just have jobs that keep us tied to a desk all day. We try to compensate by exercising in the mornings or evenings and on weekends. What I learned from the video, however, is that while regular daily exercise is great, it’s not enough to protect you if you sit for long periods of time. I didn’t realize that it’s not so much the total number of hours you sit every day, but the consecutive number of hours you sit each day without getting up for a break. Why? And why isn’t the recommended 30 minutes of physical activity every day enough to counteract the deadly effects of sitting? That’s a harder question to answer, and unfortunately we can only speculate. Obviously some of the harm comes from sitting leading to weight gain and obesity, which are linked to all of the diseases I’ve mentioned already. But there’s likely more going on. Some scientists believe that sitting signals the body to shut off certain enzymes that help clean fats our of the blood stream, and might also prevent the body from properly regulating inflammation and blood clotting. He refers to a couple of studies that had one group sit without interruption for 2 or more hours, while other groups got up more frequently and walked around for different periods of time. Each group then had their blood glucose and insulin levels measured. What these studies found was that walking as little as 2 minutes after every 20-30 minutes of sitting improved glucose metabolism and kept blood glucose and insulin at healthy levels. And healthy levels of glucose and insulin can prevent weight gain, diabetes and heart disease. This video was a wake-up call for me that I need to get up and move at least every hour. I underestimated both the risk of sitting for long periods and the benefit of walking around for just a few minutes. I don’t have an Apple watch or a Fit Bit to ping me every hour as a reminder, but I found a stopwatch app for my computer that will beep every 45 minutes.